When you become a professional woodworker, electrician or even plumber, there are some special tools that you may require to enhance the quality of the work that you deliver. The circular saw is one such tool as it has the ability to cut through different materials. However, you do not need to buy the full size one, as you can get the best mini circular saw, which will be equally effective. There are so many different brands and models of this saw and this will be useful for both DIYers as well as professionals. While having different models gives you a wide range of choices, it can be quite confusing. You will want to find a model that works for your good and one that is worth the price. This is the main reason why I have put together this guide so that you can make an informed decision on the right model. Following this guide, you will realize that it is much easier to pick the best circular saw for the money. Let us look at some critical details to help us understand the mini circular saw. Why Mini Circular Saw and Its Benefit? A mini circular saw is a great tool that everyone professional needs to have. It is compact in size and usually light in terms of the weight. However, it is so powerful and can give you controlled cuts. You will be able to use the saw to make cuts in tight spaces, without compromising on the quality of the work. The biggest task for you is to find the best mini circular saw and you will enjoy plenty of benefits. This is a portable tool, thanks to the small size and lightweight. As such, you can make it be your job site tool. When you have to make cuts in tight and hard to reach places, the circular saw will be the perfect tools to use and you will get accurate cuts. There is an advantage of being able to cut through different types of materials using the saw and as such, it can be used across different professions. The ergonomic design is essential in the mini circular saw as it gives you great comfort as well as control when making cuts. This will also prevent strain to your muscles. You can choose to have either the corded or cordless models, depending on the type of projects that you have. 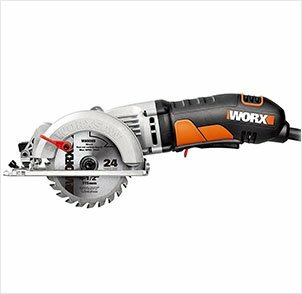 WORXSAW is one of the top rated mini circular saws that you will come across on the market. This has attracted professionals and hobbyists, alike due to the versatile features that it has. This is one of the saws that makes it easier to adjust the bevel angles as well as the depth cuts. With this model, you will be able to cut through lumber that is 2 inches thick, easily. It is one of the lightest saws as well and as such, you will be able to handle it, without straining your muscles. You can use it on different projects and achieve perfect results. The reason why this saw is used across different industries is due to the fact that you can use it to cut through assorted materials. Some of the materials that you can cut using this saw include wood, metal, plastic and tiles. This saw is small, but it as powerful as the full size, 7 ¼ inches circular saw. As such, there is no point in getting the bulky saw, when you can get the same functionality from the mini version. The depth gauge can be set up to 45 degrees in a snap. This model of mini circular saw comes with a left side blade and as such, the cut line will be visible at all times. The manufacturers of this saw are committed to offering precision in the cuts and this is why they have included a parallel guide. There is a 24 T carbide tipped blade that comes with this saw and it also includes a vacuum adapter that clears the dust from the cut path. This is the best circular saw if you want to make clean and accurate cuts. There is a safety trigger on the grip of this saw and this will make it possible to get controlled cuts. 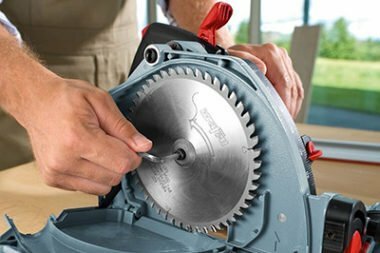 While this mini circular saw is only 4 ½ inches, it gives you the same performance of a full-size circular saw. You can make 2 x 4 cuts with just a single pass. The blade of this saw is on the left side and as such, the cut line is clear and you will be able to see it clearly. The parallel guide is attached to enhance the accuracy of the cuts made. The Makita SH01ZW is one of the best cordless saws that you can have in your possession. This tool comes with a powerful motor that has the capacity to deliver 1400 RPM and this is an assurance of fast and accurate cuts. There is a depth adjustment as well as a bevel capacity of 0 to 45 degrees, which facilitates fast adjustments. With this mini circular saw, you can be able to make a maximum depth cut off 1 inch at 90 degrees and 5/8 inches when set to 45 degrees. The versatility of this saw is worth mentioning. This saw is powered by a 12-volt max Lithium-ion battery, which you have to buy separately. The battery is known to have a long runtime and you can use it in for job site tasks and be able to achieve the same power as the one delivered by the corded models. There is a blower function that has been included as part of the saw and this will clear the dust from the cut line and improve your visibility at all times. With the Makita SH01ZW, you can be sure of accurate and neat cuts. There is another advantage of the tool weighing only 3.3 pounds when the battery is inserted. This is quite light and as such, even when you work for extended periods, you will not have fatigue. As a way of enhancing your comfort, the saw comes with a soft grip handle and the compact design makes it fit in your hands properly. The Makita SH01ZW is a great tool when you want to make fast cuts and also trimming applications. Sadly, even with all these features, this mini compact saw has been discontinued by the manufacturer. The Makita SH01ZW has a built-in motor that will deliver spins of 1,400 rotations per minute, which gives you faster cutting. You will have the option of adjusting the blade for depth cutting of up to 1 inch at 90 degrees and 5/8 inches at 45 degrees. 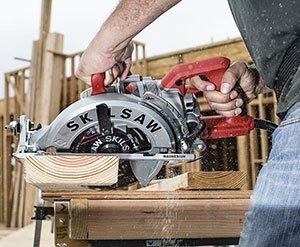 This mini circular saw weighs 3.3 pounds when it is has a battery attached, which is quite light and makes it easier to navigate cuts. The rubberized soft grip handle and the ergonomic shape makes it fit like a glove and this will give you accurate cuts. There is a built-in dust blower that will help keep the cut line free of sawdust and any debris, to give you good visibility. 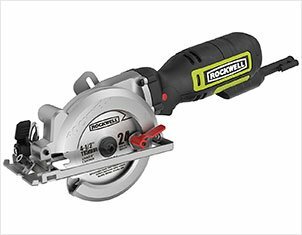 The Rockwell RK3441K is a mini circular saw, with 5 amp motor, which runs at 3,500 rotations per minute. It is quite powerful and functional and you will love every single bit about it. It is a 4 ½ inch saw and is an ideal replacement for the traditional circular saw, which is 7 ¼ inches. As such, you do not have to carry the bulky saw, when you can carry a mini circular, with the same capability. With this model, you can be able to make cuts on 2×4 pieces as well as sheet goods conveniently. The saw is also light and as such, you can take advantage of the lightweight as well as the compact design. This is a much better improved as opposed to the heavy models. You can make cuts on materials that are less than 2 inches thick, with this saw, without any problems. If you are looking for a way to tackle the cutting jobs with great comfort, control and ease, then you need to get the RK3441K circular saw. You will just need one hand to operate this saw, which is an added convenience. The handle of the Rockwell RK3441K has a slim grip, which will enhance the control as it fits into the hand. This makes it easier to maneuver it and the result is that you will be able to make cuts fast and accurately. The saw weighs 5 lbs. which is pretty light and easier to carry and handle. The blade is on the left side and this will give you great cut line visibility. There is also a dust port that has been included to eliminate the dust and improve your visibility and enhance precision. Weighing 5 pounds, this model is about 50% lighter than the full size, 7 ¼ inches circular saw. The RK3441K give you the same functionality of the normal circular saw. It comes with a 5 amp motor that delivers maximum speeds of 3,500 RPM and this gives the power to cut through 2×4 stock in a single pass. The blade is on the left side and this gives you a clear view of the cut line. The slim inline grip on the handle will give you exceptional comfort and control, making it easier to maneuver overhead cuts. There is a dust collection port on the Rockwell RK3441K, which will eliminate the dust to clear the cut path. The Genesis GCS545C is the best mini circular saw in regards to many aspects. It is one of the saws that offers an excellent grip, which results in great control and accurate cuts. There is a 5.8 amp motor which gives this model enough power to be able to make cuts through different types of materials. Its triple reduction gearbox is another critical feature, especially when you have to deal with heavy-duty applications and make cuts. This is one of the tools that you can be sure that it will not compromise your safety, at any point. The HSS blade that works with this saw is quite useful as it allows you to cut aluminum and copper materials, easily. This saw is known to be able to cut twice as much as you would be able to with a manual saw. It is pretty light and as such, you will have an easy time handling it, even for overhead tasks. Due to its compact nature, you will make cuts on very tight spaces without a problem. Angle and depth adjustments have been simplified on this saw, to give you the desired results. Visibility is quite essential when it comes to making accurate cuts. The Genesis GCS545C is keen on that issue and as such, it comes with a dust port unit as well as a vacuum adapter. With this, you will not have to worry about debris being on the cut line, inhibiting your visibility. There is a blade wrench that will allow you to change the blade with ease. There is a 24 T carbide tipped blade that has been included and this will be used to make different cuts. The advantage of this model is that it will give you the same functionality as the full-size circular saw. The dust collection unit has a vacuum adapter to eliminate the debris from the cut line. This is a lightweight circular saw and has a compact size, yet it is quite powerful as it comes with a 5.8 amp motor and a triple gear reduction mechanism. The 24 T carbide tipped blade is included, but there is also a blade wrench that will make blade changes easier. You will use the Genesis GCS545C to cut two times the material that a normal handsaw would cut. There is an excellent control grip, which allows you to make cuts with precision. 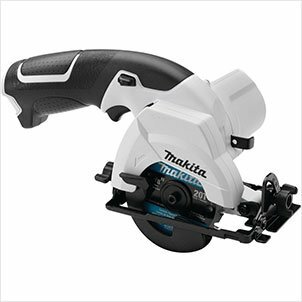 Last on this list is the Makita SH02R1, which is a cordless mini circular saw. 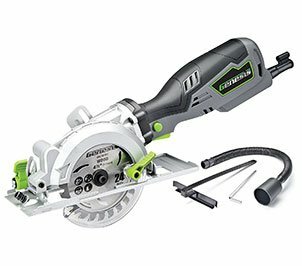 This 3 3/8 inch saw s powered by a 12 V Max CXT Lithium-ion battery, which gives it power that is the same as the one on corded models. The ultra-compact size is ideal and will give you the versatility to be able to cut through different applications. This is one model that is said to deliver maximum power and speed when it comes to making it cuts. There are 2 batteries that are included in this kit and they will give you adequate run time. The onboard LED charge indicator will ensure that you are not caught off-guard. You can tell when the batteries are running out of charge. 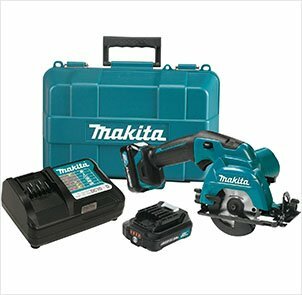 The Makita SH02R1 is one of the lightest models that you will find on the market as it weighs 3.5 pounds. You can easily carry it to the job site and you will easily use it, without straining your muscles. The motor has the capacity to run at maximum speeds of 1,500 rotations per minute and this will give you fast and accurate cuts. With this mini circular saw, you can be able to cut different materials, with 1-inch capacities, like MDF, plywood, particleboard, drywall, pegboard and melamine among others. If you are looking for a solution that will allow you to make cuts in very tight spaces, the Makita SH02R1 is the ideal one, due to its compact design. As a protection mechanism, there is a battery protection circuit that will prevent any cases of overheating, over-discharging and overloading. This model comes with a built-in dust blower that will get rid of the debris and give you great visibility. When the Makita SH02R1 has the battery fitted the total weight is 3.5 pounds, which is quite light and will reduce fatigue. It comes with a compact design, but it is powerful enough to be able to cut materials that are 1 inch thick. There is a dust blower, which is responsible for keeping the line of cut free of any dust and debris, to enhance accuracy. The Battery Protection Circuit is an innovative feature that will prevent the unit for over-discharging, overheating and overloading. The Makita SH02R1 has an ergonomic handle that has a rubberized soft grip and this will increase your comfort. The design of the mini circular saw is quite important. You should scrutinize the saw to ensure that you have great ergonomics and a design that will increase productivity. Seeing that this is a power tool, you need to also focus on safety issues. Look at the design of the handle and the type of grip that has been provided. Picking a model that fits into your hands is advisable as it will be easier to control it. You do not want to have a circular saw that is hard to maneuver when using it. Whether you are choosing the corded or cordless saws, you need to be sure of the power that it has. This is usually measured in amps and the focus feature, in this case, is the motor. In most cases, models will be about 5 amps on average and this is known to be effective for the basic tasks. However, if you are engaged in heavy duty cutting, you can consider motors that are 10 to 15 amps. Are you looking for a battery powered model or a corded saw? 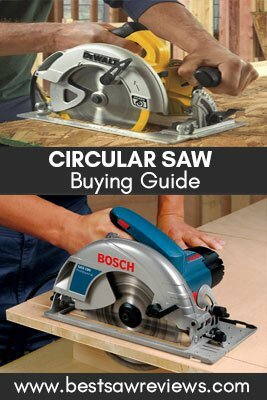 When searching for the best circular saw, this is an essential consideration. If you have many job site projects, then it is better to pick the cordless models as they can be used anywhere, without any limitations. 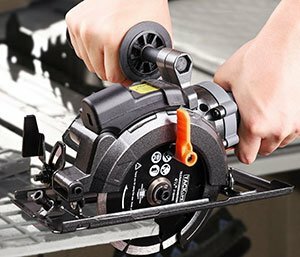 However, if you work from your workshop, mostly, you should go for the corded mini circular saw as it more reliable in terms of power output. It is important to consider the type of blade that the saw will support. This will be influenced by the type of materials that you wish to cut with the saw. While looking at the blade, it is important to pay attention to the blade change mechanism. There are modern mini circular saws that have a tool-less system and this will speed up the process of installing, changing and removing the blade. This is one of the ways of enhancing productivity, without wasting too much time. 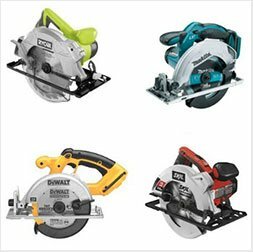 If you are looking for more information about different types of circular saw blade and how to safely change go here right away. There are some models that seem to have a very high vibration and this causes fatigue and also will affect the quality of the cuts that you will make. You should find out from the manufacturer and other experts if the saw has reduced vibration. Even the model that has the best padding, but has a high vibration level can be quite uncomfortable. Wear the right attire and protective gear when using the saw. You will need dust masks, safety goggles, gloves and also workshop shoes. Avoid any loose clothing as they may be caught by the tools. If you have a corded mini circular saw, you need to keep the cables out of the way when you are cutting materials so as to prevent hazards. The pieces that you are working on should be supported properly to enhance your safety. If possible you need to use a workbench or a clump. Do not be distracted and always ensure that your eyes are on the workpiece and your hands on the saw at all times, so as not to lose focus. Your work areas should always be clean and free from any dust or debris. With a clean environment, you will have good visibility and achieve clean and precise cuts. You need to maintain proper body balance when you are working with the best circular saw so as to avoid accidents that may end up in serious injuries or fatalities. The blade should be sharp before you can make any cuts and as such, you need to check this before you commence the work. Do not make any adjustments on the saw while the saw is still running. You should turn it off and disconnect the power source. You should never operate the saw while intoxicated as this can cause accidents easily. Before making cuts, inspect the workpiece and remove any objects that may cause kickbacks. 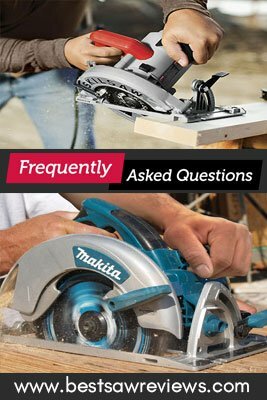 Q: Should I buy a corded or cordless mini circular saw? A: The choice of saw that you will end up buying will depend on your needs. 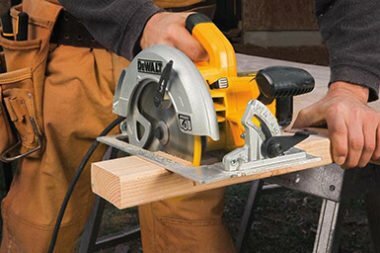 The cordless saw is suitable for job site projects, while the corded models are best suited for workshop tasks. Q: Which blade will work with my mini saw? A: This will depend on the specific model that you have. In most cases, the saws will have a carbide tipped blade, with an option to change it depending on the material being cut. Q: How much power will my circular saw deliver? A: The power delivered by the saw will depend on the motor that you have. Most motors are between 3 amps to 15 amps. It is best to confirm the power level before buying the saw. Q: Does my cordless mini saw come with a charger and batteries? A: Some models will come as a complete kit, but in other models, you will have to buy the batteries and charger separately. Q: What materials can cut with the circular saw? A: The circular saw is quite versatile and can cut different materials like metal, plastic, melamine, wood, MDF and plywood among others. There is a great advantage of choosing to have the mini circular saw as part of your tools. This compact saws will spare you the trouble of having to carry the bulky, full size saw as they are quite effective. There are so many models on the market and you can end up being confused. However, with this guide, the process should be much easier and you can easily pick one that suite you. I have reviewed a number of models and have picked my top 5, which I have shared in this guide. From my top choices, I recommend the Rockwell RK3441K 4-1/2” Compact Circular Saw as the best mini circular saw, as it comes as a complete kit and has so much to offer. With the insight that you have gathered from this article, please share it with others so that they can also be in a position to pick the best circular saw.